On Saturday, I left a bit earlier so that I could pop into the sale on the way to bootcamp class. I carry my weights in my backpack, so I grabbed my mat and off I went to class, via the moving sale. I saw some little glass and ceramic bowls which I like to use to sort beads into when I am choosing colours, the whole box was the deal, so I snagged that. Then I saw some massive, clear, crystal cut, acrylic beads in the bottom of a plant saucer, I asked if they were for sale and they were mine! Off I went with my box of bowls and beads, yoga mat and 16lbs of weights! Thankfully I only got a few awkward steps and my friend gathered me into her car and whisked me off to class. When I got them home and washed them up, I made a ring from one of the smaller beads! It is a gigantic ‘rock’! A statement piece shall we say! Super fun to wear though. 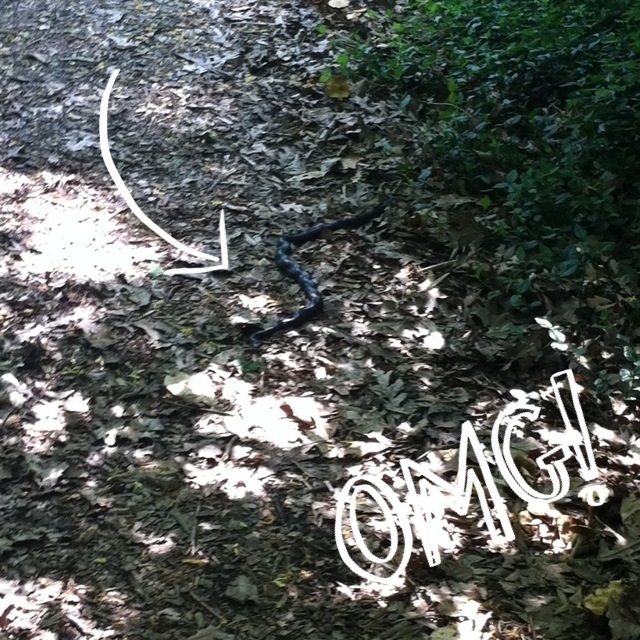 Another activity we did this weekend was snake hunting….yikes, I don’t think so, this one hunted us!! 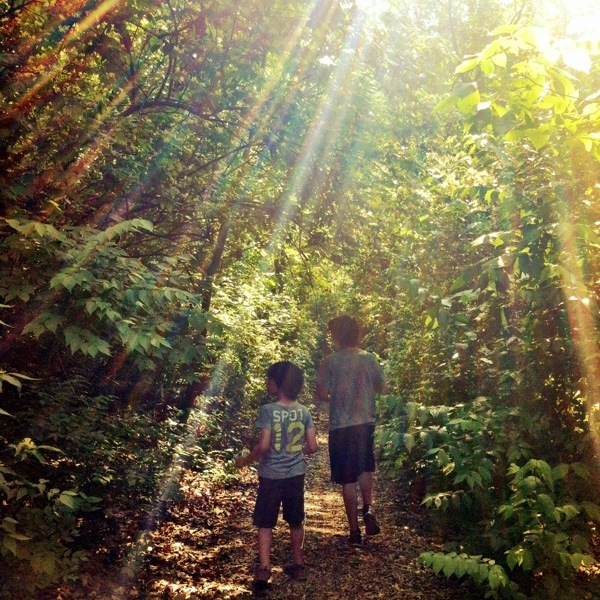 We were walking through the woods minding our own business (see below for a pre-snake picture) and one of the boys stopped and pointed at the floor wildly. I thought he had seen a turtle which is usually the most excitement we get out of the woods. Not today, today we met this big dude. The photo isn’t so clear because I was not getting any nearer thank you very much. We actually turned around and went another way home to avoid actually having to walk past the snake! I looked him up when we got home and I think he is a Black Rat Snake and non-venemous. We were ignorant of this knowledge when we came across him, but even knowing he wasn’t going to sink killer venom into me, I am fairly sure we would have made the detour anyway! This is the biggest snake I have seen without a pane of glass between us, impressive compared to the garden snakes I see almost every day. That was an awesome find at the moving sale you went too. Eeeeks at the snake though, and I would have turned back too. I am so pleased we don’t have them here in NZ. AMAZING find at the yard sale. What a keen eye for spotting those treasures. Oh, and that last photo is just precious! Previous PostA Beautiful Mess iPhone app is here! Next PostWraptastic! New wrap bracelets on Etsy.